Bob Gibbons, who is one of the top talent evaluators in high school basketball, has high praise for Reco and named the most talented overall prospect along with Patric Young (Florida commit) at the 14th Annual Bob Gibbons Fall Evaluation Clinic at Wake Forest University where over 200 young prospects showed up. He also attended the Wake Forest Elite Camp. The potential for Reco McCarter is limitless and his ceiling is sky high. He is 6'7 and runs the fast break like he is a point guard. In fact the fast break is where McCarter thrives. He has great handles for someone his size and can go coast to coast in the blink of an eye. If this lefty were to be described in one word it would be the word explosive. He loves to attack the rim and is ferocious in his approach. Reco is also a skilled passer on the break and within the half-court offense. He has a well-developed spin move that seems to be his bread and butter. His quickness and length make McCarter a nightmare on defense. Lack of effort is not in his vocabulary: he plays his heart out. Truth be told, this wonderful attribute leads to his weaknesses as well. Reco plays with so much energy that he can at times be out of control and take poor shots. He also needs to work on his perimeter shot. If Reco can harness some of his energy (mentally and physically) and develop his perimeter shot, he will be a nightmare of a mismatch in college. Even though Wake Forest hasn't officially offered Reco yet, most people think that they are a major contender as well. 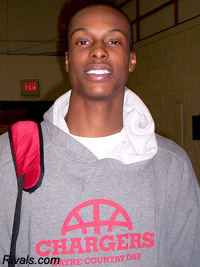 Reco is the #22 SF in the 2010 class and the 128th player overall. "Reco is a long, athltletic and wiry strong lefthanded perimeter player who's blessed with exceptional talent," Biancardi said. "He's smooth and he scores in a variety of ways. "He excels in an up-tempo transition game where he can go from defense to offense efficiently. He's a finisher with flair in transition." McCarter's athleticism allows him to do a variety of different things on the court. "He's a versatile scorer who can make 3's as knock down mid-range jumpshots with ease," added Biancardi. "On his jumper he elevates and see's over his defenders for easy buckets. "Reco also handles the ball well for a small forward and is capable of putting up big numbers with more physical maturity and coaching." McCarter also has the defensive skills that the VCU staff covets, according to Biancardi. "He really shows his versatility on the defensive end of the floor with his athleticism. HIs quickness combined with his outstanding length allows him cover a lot of ground on the court in a fullcourt press situatuion. He can also close out on shooters in the blink of an eye making him very difficult to shoot over. "He does need to get stronger and be a more consistent plyaer but that should come once he physically matures." Biancardi cannot help but notice the terrific start Smart and his staff are off to in Richmond. "The new VCU staff have landed a kid who can really fit into their future plans. He'll thrive and produce in the Rams' fullcourt pressing style of play. McCarter's athleticism and versatility give them a weapon on both ends of the floor. Reco needs to put in some time in the weight room and work on his perimeter game, but he’s a tantalizing prospect and is one of the more highly touted prospects in recent VCU history. Coach Shaka Smart during one of his weekly broadcasts mentioned that Reco committed to VCU after visiting Georgia out of the SEC and Oklahoma out of the Big 12. The kid is a player and his above-the-rim athleticism should entertain Ram fans for years to come.